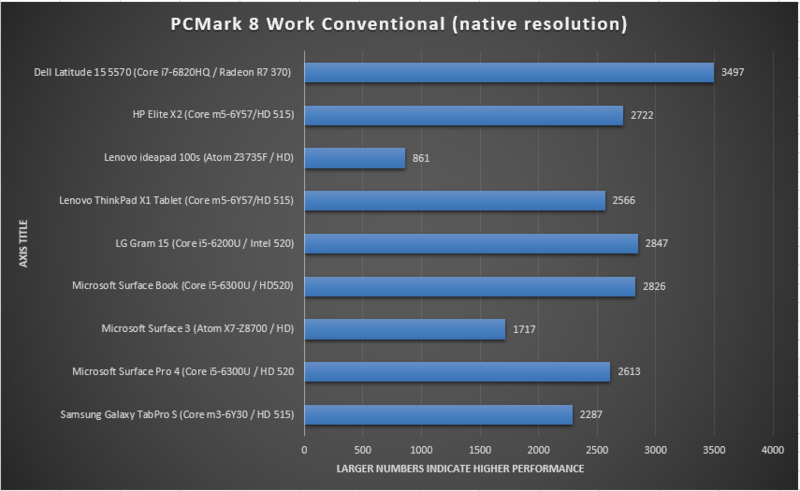 It would be a disservice to Lenovo’s ThinkPad X1 Tablet to focus solely on the benchmarks. 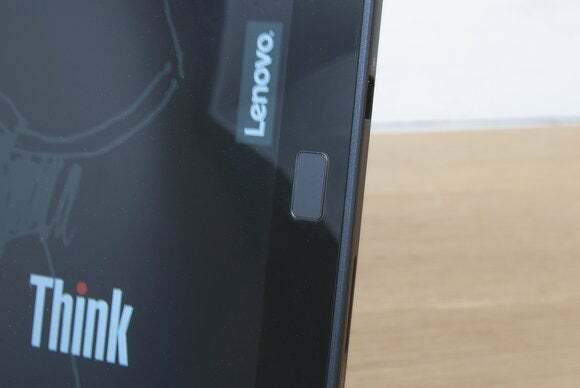 Because while other competitors in the convertible tablet space might boast superior performance, Lenovo’s latest entry to the ThinkPad line honors the brand’s legacy with a series of thoughtfully considered touches, including a bookend kickstand that seems obvious in retrospect. There’s a good chance you’re mulling over Lenovo’s ThinkPad X1 Tablet convertible based on the strength of the ThinkPad keyboard alone, long considered an industry gold standard. 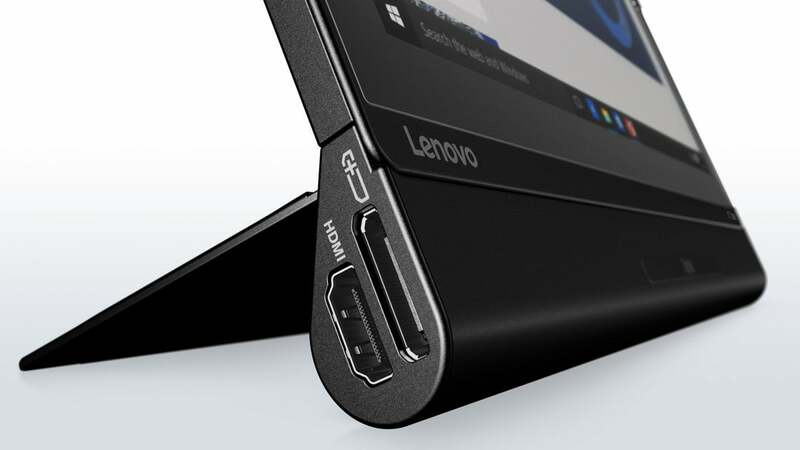 Lenovo complements that with not one, but two options for storing the included stylus, as well an ingenious kickstand that folds flat across your legs, making lap work feasible. You also get a display that’s among the higher-resolution options available at 2160x1440, albeit still markedly lower-res than the screen in Microsoft’s Surface Pro 4 (2736x1824). In all, I’d call the Lenovo ThinkPad X1 Tablet a perfectly competent Windows 10 tablet, whose 1.1GHz Core m5-6y57 processor and 8GB of memory can chew through average office tasks with aplomb. Corporate admins should consider it for the optional vPro manageability technology, the TPM 2.0 security chip, and the rear screws that allow access to the battery, WWAN, and SSD. Otherwise, my nitpicks include the mediocre trackpad and the possibly redundant buttons that flank it, as well as the iconic ThinkPad trackpoint, which may be getting a little long in the tooth. Still, Lenovo’s never stood for flair and whimsy: It’s a ThinkPad. It gets work done. Yes the red dotted “i” is indeed an LED power light, as in ThinkPads past. The ThinkPad X1 Tablet itself measures 11.48 x 8.25 x 0.34 inches, and weighs just 1.69 pounds—light enough for one-handed use with a stylus. The tablet body is built of magnesium, in ThinkPad black of course; you shouldn’t have any problems with smudges. With the keyboard, the total weight comes to 2.35 pounds, on the lighter end of the convertible tablet range. Unlike Microsoft’s Surface series, the keyboard is included in the price of the ThinkPad X1 Tablet: $1,349 for our review unit. The Core m5-6y57 in our unit has a base clock of 1.1GHz, but can theoretically reach 2.8GHz in turbo mode. (As we note below in the performance section, that rarely seems to happen, due to some throttling.) Core m3 and Core m7 are also options. Our unit shipped with 8GB of 1,866MHz low-power DDR3 memory, soldered to the motherboard, and 256GB of storage. By comparison, Microsoft’s own Core m3 version of the Surface Pro 4 costs just $899, with 4GB of RAM and 128GB of storage, but you’ll need to pay $130 for the Type Cover, too. The ThinkPad X1 Tablet's magic happens via the 12-inch, 2160x1440 IPS touchscreen display, coated with Corning’s Gorilla Glass and supporting up to 10 fingers of touch input. An LED backlight projects a fairly robust 390 nits of illumination through the glass, with an 800:1 contrast ratio. Our model also shipped with a fingerprint reader mounted where the Windows “home” button would reside in years past, enabling easy logins via Windows Hello. A fingerprint reader mounted on the front of the tablet offers Windows Hello support. A microSD card slot, which supports up to 64GB is tucked away under the kickstand. The ThinkPad X1 Tablet hosts a number of connectivity options, including the choice of either a dual-band 2x2 802.11ac card, or a tri-band Wi-Fi/802.11ac card with WiGig on top of it. An NFC smart card reader is optional. All of these features are available in some form or another in competing tablets. But Lenovo has also come up with something a bit unique: three ThinkPad X1 Tablet “modules” that add various functionality. Some earlier ThinkPads boasted optional “barrel batteries” that could add battery life—these three modules go beyond that. The modules all fit between the tablet and the keyboard: There’s the $150 Productivity module, which combines an additional 24Whr battery, USB 3.0 connector, HDMI, and OneLink connection; the $280 Presenter module, which adds a pico projector for presentations, HDMI, and a 10Whr battery; and the $220 3D Imaging module, which adds an Intel RealSense depth camera, HDMI, and a USB 3.0 port. The ThinkPad X1 Productivity modue is just one that adds extra functionality. 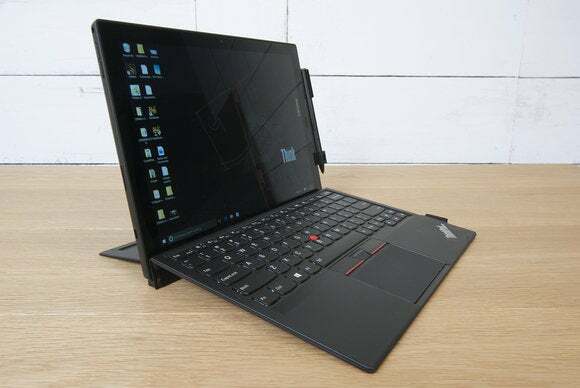 While these modules certainly have the potential to set the ThinkPad X1 apart from other convertibles, they weren’t available for evaluation at the time of this review—Lenovo says they will begin shipping later this month. Once we’re able to try them, we’ll update our review. 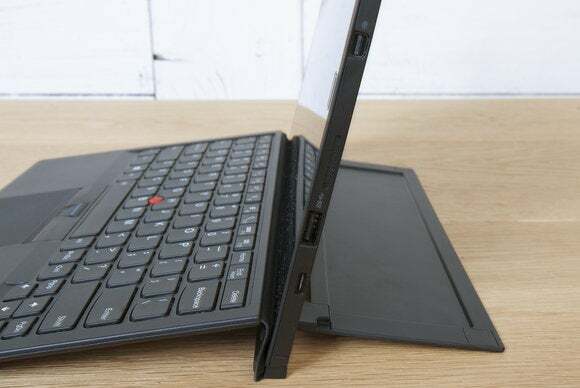 Virtually all convertible tablet PCs include a kickstand to help support the weight of the tablet, and the ThinkPad X1 Tablet is no exception. 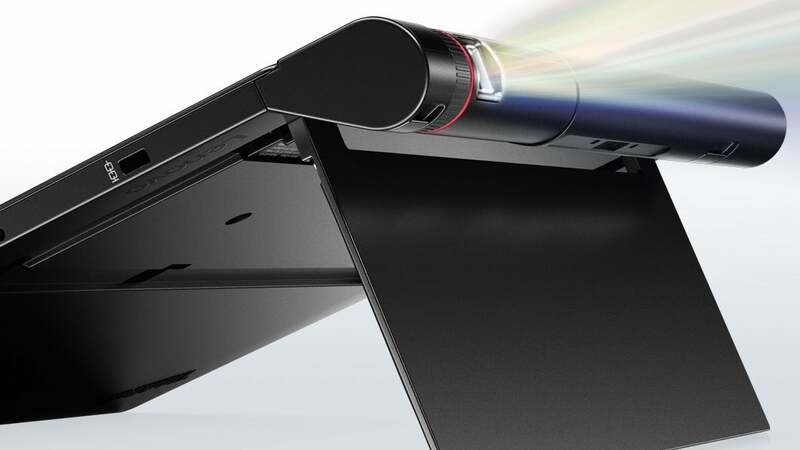 What’s unique about the ThinkPad X1 Tablet, however, is that the kickstand folds out from the bottom of the tablet itself, providing a stable and, most importantly, flat surface to bear the tablet’s weight. Typically, convertible kickstands focus the weight on a narrow strip of plastic or metal a few millimeters thick (like a bicycle’s kickstand), which can press uncomfortably into your thighs. Lenovo distributes the weight over a 3-inches-deep plate that runs almost the width of the tablet, providing support and comfort. The kickstand unfolds after sliding a small latching switch on the rear of the tablet. The flat surface makes it very comfortable for lap use. The kickstand design is a clear victory for the ThinkPad X1 Tablet. It’s not perfect, though: At an incline of about 30 degrees, the kickstand’s hinge isn’t quite strong enough to support the tablet’s weight, and a touch or movement will make it gently fold flat. This is about as far back as the Lenovo X1 tablet’s kickstand will allow before it folds flat by itself. Otherwise, the hinge allows the kickstand to rotate to nearly 90 degrees, and is resilient enough to support the device when flipped into presentation mode, as seen below. The Lenovo Presenter module, shown her with the ThinkPad X1’s kickstand extended. I’m equally impressed with how Lenovo addressed the pen problem. If you’ve ever transported a convertible tablet, you’re likely aware of how easily the pen vanishes into the depths of a bag or briefcase. The HP Elite x2’s string tether solves the problem but looks childish, while the Surface Pro 4’s magnetic pen clamp can’t withstand the jouncing of my backpack. 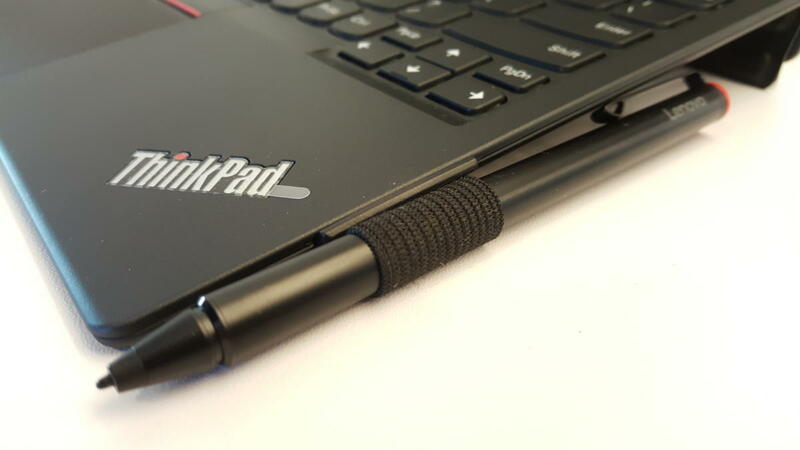 Only the Surface Pro 3’s pen loop seems to have solved the issue, and the ThinkPad X1 Tablet uses a similar approach. A pen clip slides into the USB slot on the side of the tablet. 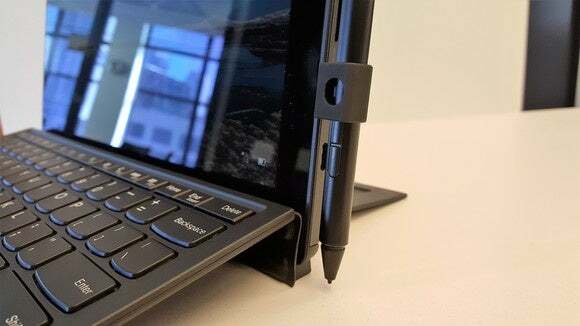 If you want to use a pen with the ThinkPad X1 Tablet (and it’s included in the price, according to Lenovo), you can slip a plastic clip into a notch in the keyboard. The attached loop holds the pen securely. But there’s a second pen option, too, for tablet-only users: a plastic pen holder that clips into the USB port. The latter option doesn’t really hold the pen securely enough to transport it in a bag or briefcase, but it does find a home for it other than your pocket when toting the tablet around. More to the point, the pen holder secures the pen whether in landscape or portrait mode, and neither pen clip blocks any ports or power connections (other than the USB port the pen holder occupies). The pen loop is connected to a plastic tab, which slides into a cutout in the keyboard. I’m less enthused about the pen itself, which feels somewhat cheap and plasticky. Inside is an industry-standard AAAA battery. Though it supports 2,048 levels of pressure, the Wacom pen only includes two configurable buttons on the shaft—there’s no “eraser” button to launch OneNote, or actually erase, a function I’ve grown used to with other pens. Lenovo may be waiting to see how many people take advantage of Windows 10’s new Windows Ink mode, but there’s still room for improvement here. ThinkPads have a reputation for great keyboards, but the ThinkPad X1 Tablet’s felt about average in key travel and resilience compared to those of other convertible tablets I’ve used. 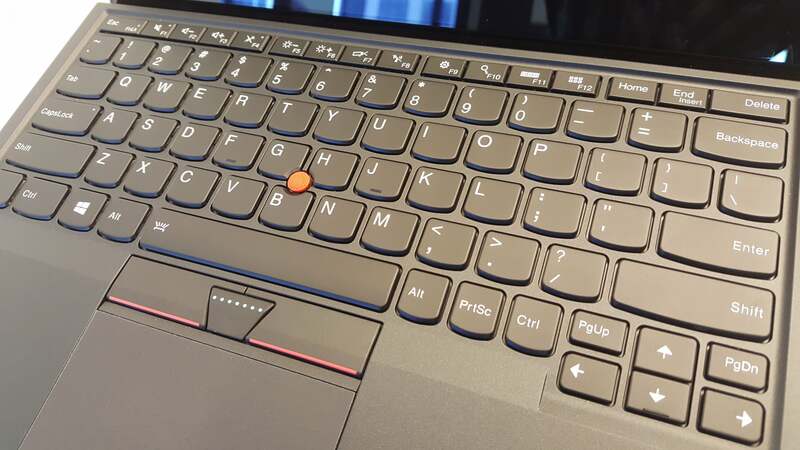 It appears that while the ThinkPad X1 Tablet’s keys are faintly scalloped, they are far less so than on ThinkPad notebooks, which might disappoint some users. I wasn’t impressed with the touchpad, which generally felt somewhat cheap and unresponsive compared to the competition. The accompanying buttons and trackpoint nubbin also seemed a bit archaic on a touchscreen tablet armed with a pen, but they’re traditions that would probably incite the ire of ThinkPad fans if removed. The X1 tablet’s keyboard should look quite familiar to previous ThinkPad owners. Finally, Lenovo includes its own utility, Lenovo Companion, which serves as an alternative to the various Windows control panels and update menus. Lenovo doesn’t force you to use the Companion app, and you might be able to get by without ever opening it. But its attractive design and overall utility make it worth checking out. My review tablet was, thankfully, free of bloatware, though Lenovo does recommend certain apps for you to download. The WRITEit app, for example, mimics Windows Ink by allowing you to digitally mark up whatever’s on the screen, and to fill in various fields using pen input. Out of the box, the palm-rejection feature on the Wacom pen is pretty lousy. Make sure you download the updated Wacom driver from its website to improve performance. 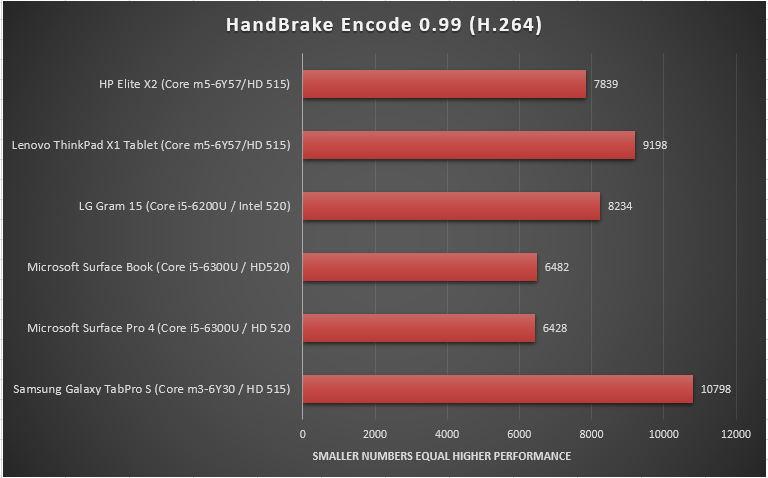 The ThinkPad X1 Tablet’s chip runs at the same 1.1GHz core clock speed as the chip in the competing HP Elite x2. 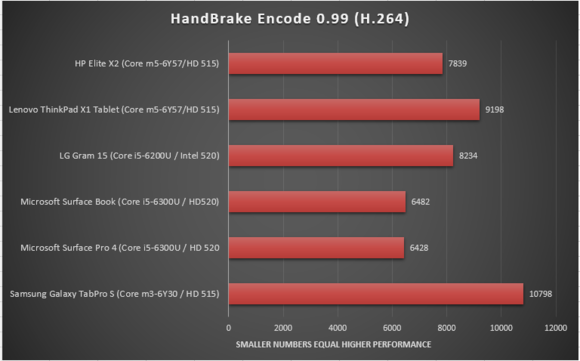 Though the two chips are very similar, the x2’s processor includes both vPro and a set of instructions focused on multithreaded performance scaling. It's possible the additional instruction support assist in the Elite x2’s performance, but Lenovo also appears to be limiting its own Core m5-6y57’s clock speed. 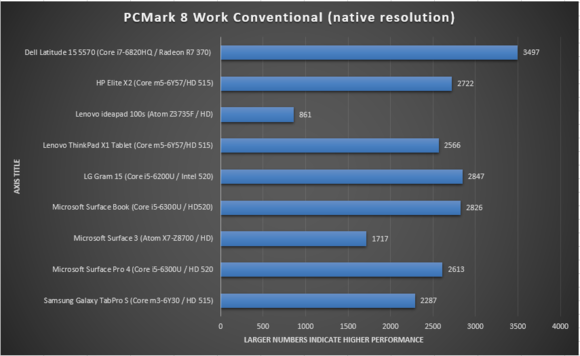 As PCWorld has done in other convertible reviews, I focused on the most common productivity benchmark, then stressed the CPU with encoding tests. Finally, though it’s doubtful you’ll use a convertible tablet for graphics-intensive tasks, I compared the ThinkPad X1 Tablet with its competition using the popular 3DMark benchmark. I also included a couple of notebooks for comparison’s sake. As expected, the Lenovo ThinkPad X1 Tablet performs general productivity tasks easily. Earlier tablets, such as the Surface 3, suffered a bit due to slower CPUs and 2GB memory. But the ThinkPad X1 Tablet's Core m5 chip is competent, and the 8GB memory allows you to open multiple browser tabs at any one time. 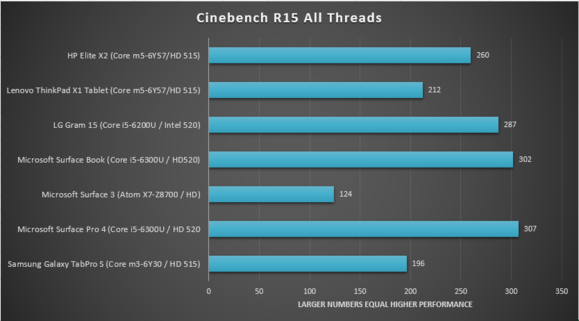 The CPU stress tests consist of Cinebench and Handbrake. 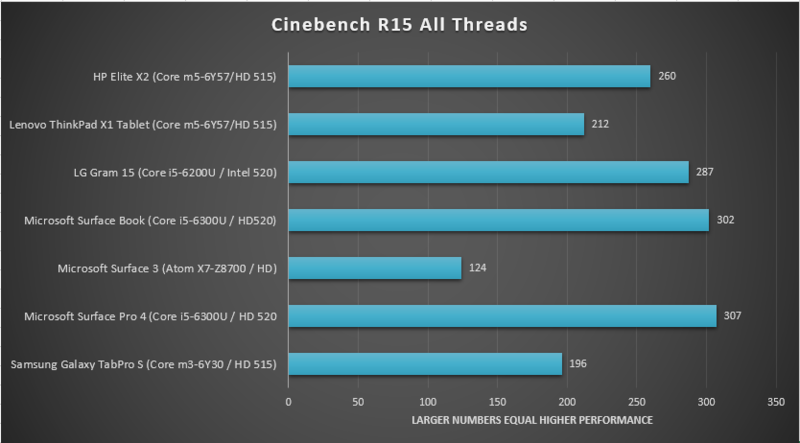 Cinebench pushes all of a CPU's cores to the limit in an attempt to render a photorealistic scene as quickly as possible. Handbrake does the same, but by transcoding a video stream. In both, the ThinkPad X1 Tablet struggles a bit. 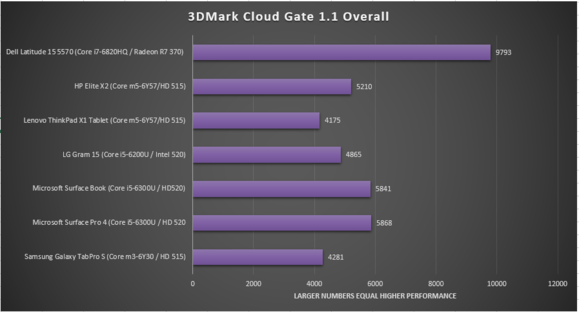 Finally, I tested the tablet using the FutureMark 3DMark suite. You shouldn’t really even consider running an intensive 3D game on the X1, but it can chew through some basic 3D tasks. 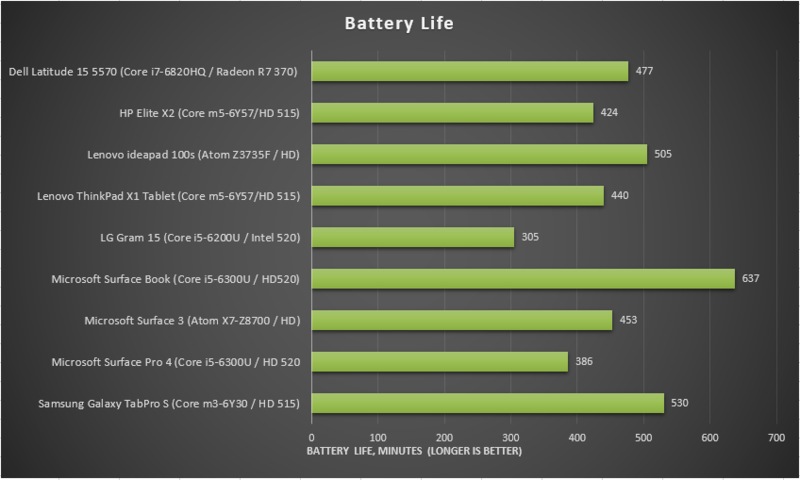 The Lenovo ThinkPad X1 Tablet features a 37.740WHr battery, on par with the Elite x2's but slightly smaller than the 39.5WHr battery inside the Samsung Galaxy TabPro S. I test battery life using a looped HD video, playing until the battery finally gives out. Here, the ThinkPad X1 Tablet performed slightly below average—still, at 7 hours, 20 minutes, it delivers pretty close to an all-work-day computing experience. If you’re the type of person who focuses mainly on benchmarks, you might be better off buying a competing convertible tablet. 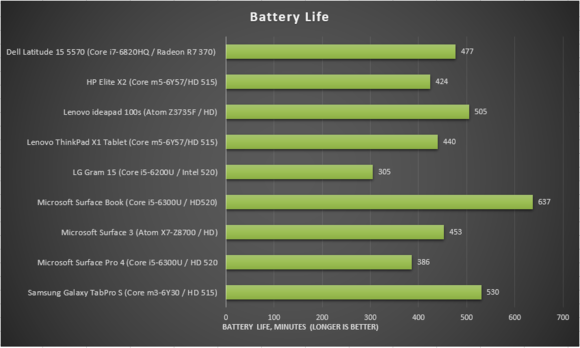 I still rate the ThinkPad X1 Tablet highly, though, since its performance ranks in the “good enough” category for many applications. 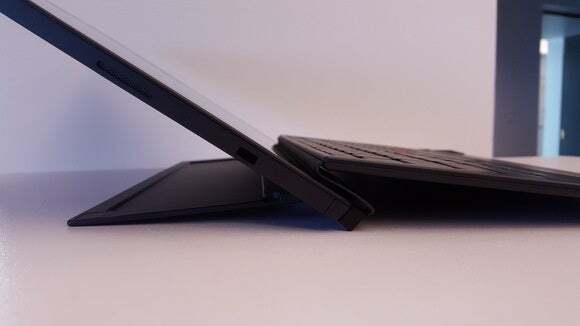 Conveniences like the kickstand and the pen loop give the ThinkPad X1 Tablet an edge and make it competitive among the ranks of the best convertible tablets.